Timberblade has been producing innovative Gator Teeth since 2008. 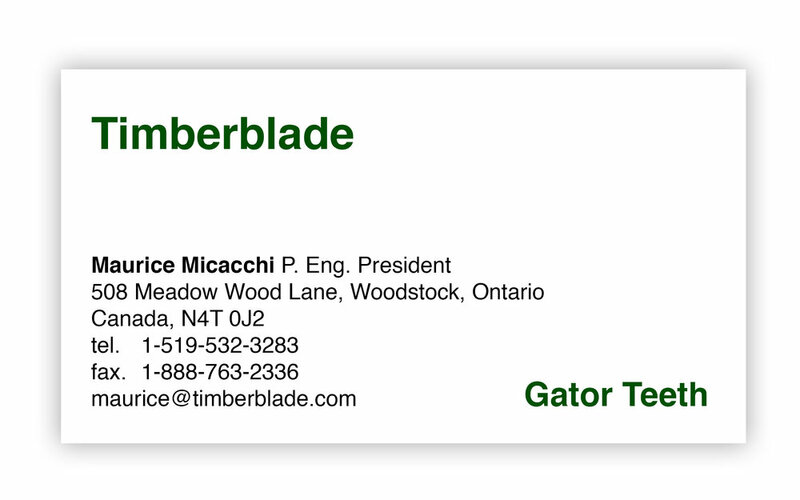 Maurice Micacchi, one of the original Koehring Waterous engineers and former Research and Development Manager at Timberjack, founded Timberblade Inc. in 2007 after the Timberjack factory was closed by John Deere in 2006. The G Series of Gator Teeth®, Timberblade's first innovation, uses a new patented technology that sets new durability and performance standards. This new generation of tooth design is amazingly simple in concept yet produces dramatic results. Field testing showed that Gator Teeth® lasted significantly longer and cut noticeably faster than competitor teeth. The new X Series are industry leading 2 1/2" self sharpening Gator Teeth, with patented design that are longer lasting and faster cutting. Timberblade produces high performance premium products, using only the highest grade North American materials and suppliers, to ensure the high quality and reliability that is so critical to our customers.